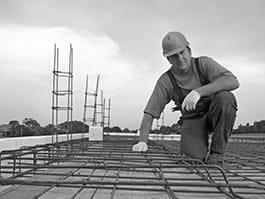 Concrete steel workers position and secure steel bars or steel mesh to reinforce concrete constructions. Read and interpret work drawings and specifications. Prepare the work, for instance determine the required materials (quantity, size, etc.). Cut and saw steel bars as detail requires. Bend steel bars as detail requires. Assemble steel bars or steel mesh, e.g. by welding or using a steelfixer's pincer. Hoist steel bars, steel mesh and reinforcements into place. Connect columns, beams, footings and girders. Position and fix reinforcements ready for concrete pour. Prepare the concrete, mixing sand, cement and water. Pour concrete in the concrete form.